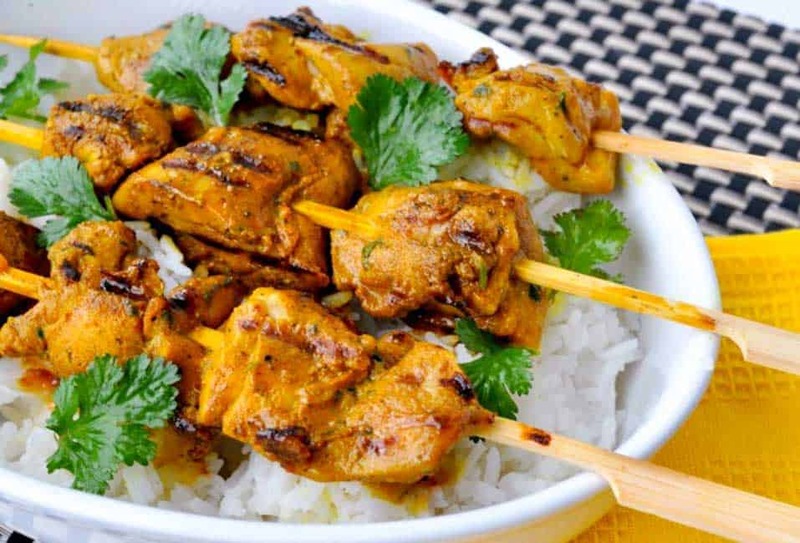 These succulent Grilled Turmeric Chicken Kabobs are spicy, salty and garlicky all in one juicy bite. 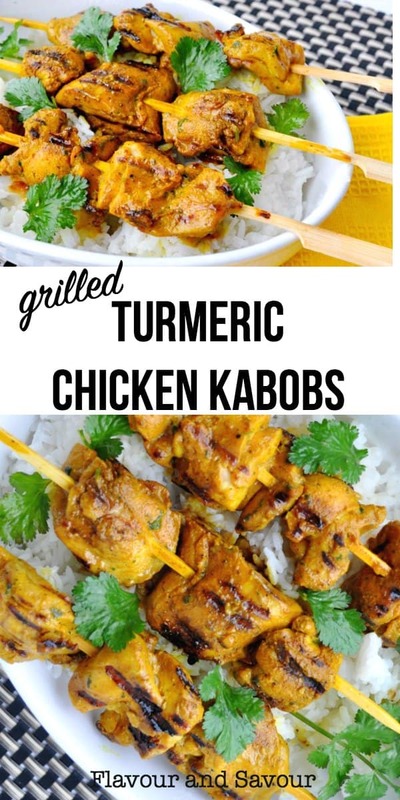 A delicious way to eat turmeric more often! 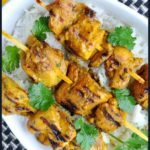 These Thai-inspired, tender grilled turmeric chicken kabobs are particularly good served over Thai Coconut Rice, made with Jasmine rice. They’re spicy, salty and garlicky all in one juicy bite. Garnish with some fresh cilantro leaves and serve sizzling from the grill. Mmmm. 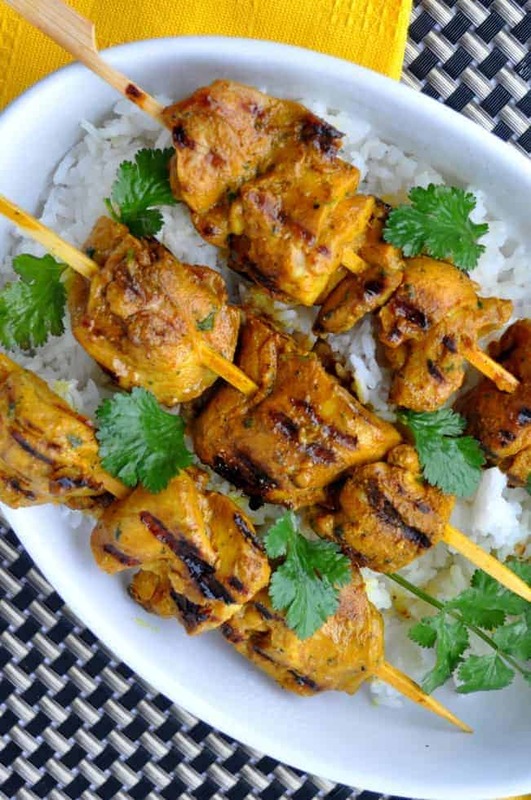 Just look at that colour on these juicy little skewers of turmeric chicken! Pure gold. You’ve read that turmeric is good for you, but have you wondered how to use it in a way your family will like? 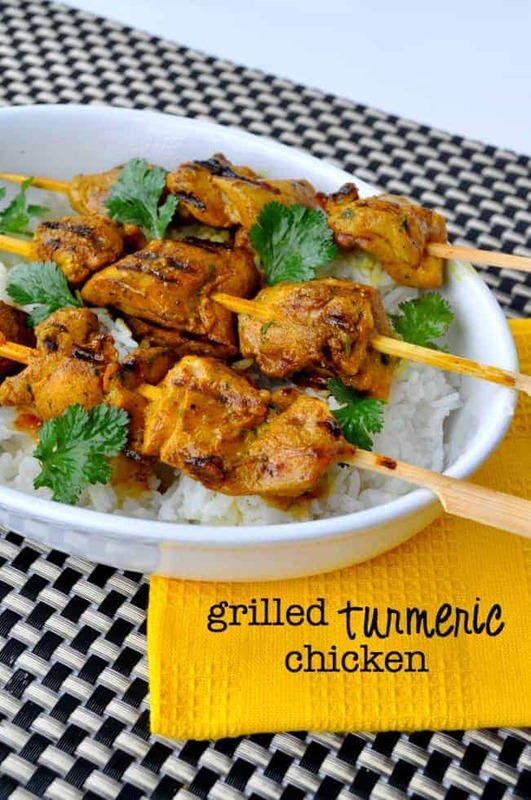 Here is a quick and easy recipe for grilled skewered chicken thighs with the added benefit of turmeric that is sure to be devoured! Let’s get started. 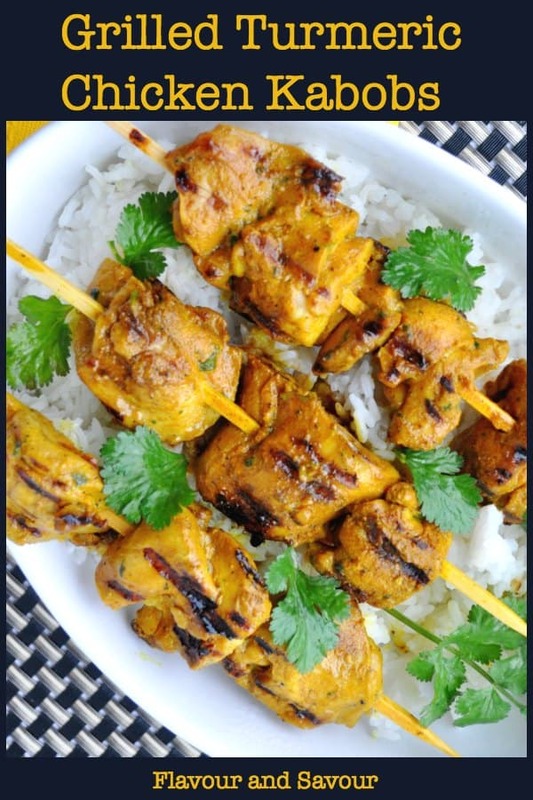 boneless skinless chicken thighs: thighs are best for kabobs as they don’t dry out like breasts tend to do. Blend marinade ingredients until a paste forms. Mix with the chicken cubes. Thread on to skewers and grill! Is Turmeric just a fad? Turmeric recipes are finding their way on to Pinterest boards, but are its nutritional benefits fact or just a fad? Western civilization has now discovered what the people of India have known for thousands of years. We should definitely be eating more turmeric. Turmeric is a powerful, medicinal herb that has anti-inflammatory and anti-oxidant properties. The curcumin it contains is believed to improve brain function (yay! ), it may lower our risk of heart disease, and it may prevent, or even treat, cancer. 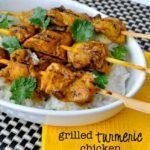 Health benefits aside, turmeric adds colour and exotic flavour to our food, and that certainly holds true for this recipe for Grilled Turmeric Chicken Kabobs. and this fabulous Honey Mustard Chicken with Turmeric. 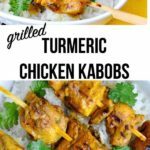 This quick and easy healthy recipe for succulent grilled turmeric chicken kabobs is a delicious way to include more turmeric in your diet. Serve with Thai Coconut Rice. Rinse and pat dry chicken. Cut into 1 inch chunks and put into a large bowl. Combine all remaining ingredients in a food processor until a paste forms. Mix the paste with the chicken chunks. Refrigerate for an hour or two to let the flavours combine. Thread the chicken on the skewers, packing tightly together. Grill over medium heat, turning occasionally until cooked through, for 10 to 15 minutes. You could use boneless chicken breasts if you like, but the thighs have more flavour and will be more juicy. This was delicious!!! My brown sugar was hard so I used maple syrup in its place and it was storming so I ended up searing the chicken on the stove and finishing it in the oven. It was so good I can’t wait to make it again! Great suggestion! Glad it worked for you. Thanks for commenting! What in the world is sugar free maple syrup? You can buy a maple-flavoured syrup made with Monkfruit Natural Sweetener which is sugar-free.